We are SPORTAGRAPHS Limited a UK registered autograph dealer. You can even collect your items from our office if that is more convenient. 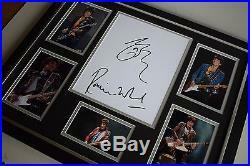 Ronnie Wood Autograph & Genuine Artwork. A Professionally framed & mounted photograph display. Overall size is an impressive 22×18 inches (56cm x46cm) – the mount within is 20×16 inches. 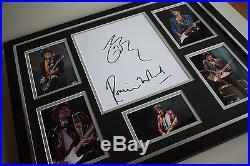 Genuine hand signed autograph from Rolling Stones singer, Ronnie Wood. The centre piece is a genuine piece of artwork, a self portrait drawn by Ronnie Wood and then autographed by him. You are looking at a fantastic huge signed photograph display. The mounted display is 20×16 inches and once framed makes the overall. Display an impressive 22×18 inches (56x46cm). This is a unique piece with a genuine hand signed autograph from Rolling Stones singer, Ronnie Wood – The centre piece is a genuine piece of artwork, a caricature drawn by Ronnie Wood and then autographed by him- a completely unique piece of memorabilia. This has been professionally mounted and framed to the highest standard and is ready to hang straight on a wall. The double mounts are made using a professional laser cutter and professionally framed with a quality black and silver trim frame that compliments the black and silver double mounted photograph display- a really impressive piece of memorabilia that would make a perfect gift or display for any fan. (Autograph Fair Traders Association Limited). Each item we sell comes with our own exclusive COA which contains a unique hologram identification and importantly all our company contact details including business address. 100% GENUINE SIGNED ITEM. At Sportagraphs Ltd we do not sell copies; auto pens, secretarials or pre printed signatures, we only sell 100% genuine hand signed items that are autographed by the celebrity. You can even collect your items from our office if that is more convenient – just give us a ring. For all framed items we use a door to door courier service. You the customer are our number one priority, we are a family business that has been trading in autographs for a number of years and prior to becoming a full time limited company we were autograph collectors ourselves. We are well known in the North West and are often out in all weathers getting autographs, not just in the UK, we travel all over to bring you the best items. We also understand that authenticity and provenance are paramount for you the customer. We do get as much photographic proof as possible wherever we can but sometimes we get only a split second with a celebrity so photo proof is not always possible. We are always available to discuss our items and you can follow us on twitter to see where we are and what we are up to in our quest to bring you the best autographs on the market. 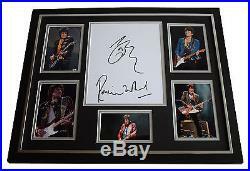 The item “Ronnie Wood SIGNED FRAMED Photo Autograph Huge display Rolling Stones ART COA” is in sale since Wednesday, June 7, 2017. This item is in the category “Collectables\Autographs\Certified Original Autographs\Music”. The seller is “sportagraphs” and is located in Warrington. This item can be shipped worldwide.